Thank you to everyone who came to the Salle Trois Armes for the celebration of Rocky’s life on December 19th. It was wonderful to see so many members of the St. Johns, Portland, and fencing communities come together to honor all the wonderful things about Rocky. Rockmond (“Rocky”) Ray Beach ( 3-11-50 to 11-13-18 ) was born in Portland, Oregon to Daryl and Gloria Beach. While quite young, his father’s business and research dealings brought the family to Japan, but Rocky and his mother returned to Portland when he was 7, and he later attended Benson Polytechnic High. His father, still in Japan, remarried to Yoko, soon giving Rocky a sister, Lyn, who later lived in Portland in adolescence; his mother also remarried, giving him a stepfather Bill Adie. While at Benson, Rocky spent increasing time with his grandparents, Hilda and Raymond Beach, in St. Johns, and at 16, excelled at the sport of fencing. Upon high-school graduation, his strong pacifist convictions and impressions of the unjustness of the war, and his decision to openly stand firm against the draft, led to his incarceration. Injuries he suffered there probably impacted his Olympic chances in fencing. Subsequently at Portland State University, Rocky taught fencing, and with Rosemary Lown and a couple of others, helped start a fencing school, Salle Auriol, which has since also become the basis for the NW Fencing Center. Rocky and Rosemary subsequently married, and he graduated from PSU with a BS in PE and Exercise Science. Rocky loved teaching, and helped to form Portland Parks and Rec fencing program, also coaching and refereeing soccer. After their death, Rocky acquired his grandparents’ St. Johns home, and lived there for many years. After his divorce from Rosemary, and working locally at Pacific Hoe, he traveled back to Japan to work with his father, some in conjunction with the World Health Organization, where his talents and understanding of ergonomics were employed, contributing to the design of new and specialized dental equipment and the training of its technicians. Back in Portland, Rocky opened a fencing school in downtown St. Johns, Salle Trois Armes, which became a central fixture. Regardless of age from 5 to 75, he treated all students with the same respect and high standards. The logo embodies a St. Johns bridge-style arch, and a camellia symbolizing endurance and beauty even in harsh circumstances. Rocky was also a DJ, and loved to play guitar and banjo, to dance, and to sing at karaoke. He never let physical challenges he experienced through life impede his devotion or gentle spirit. He is survived by his sister Lyn Arai, his partner Christine Classen, his aunts Sharon Joy and Thelma (Deva) Beach, Yukie Miake Beach, and many cousins. 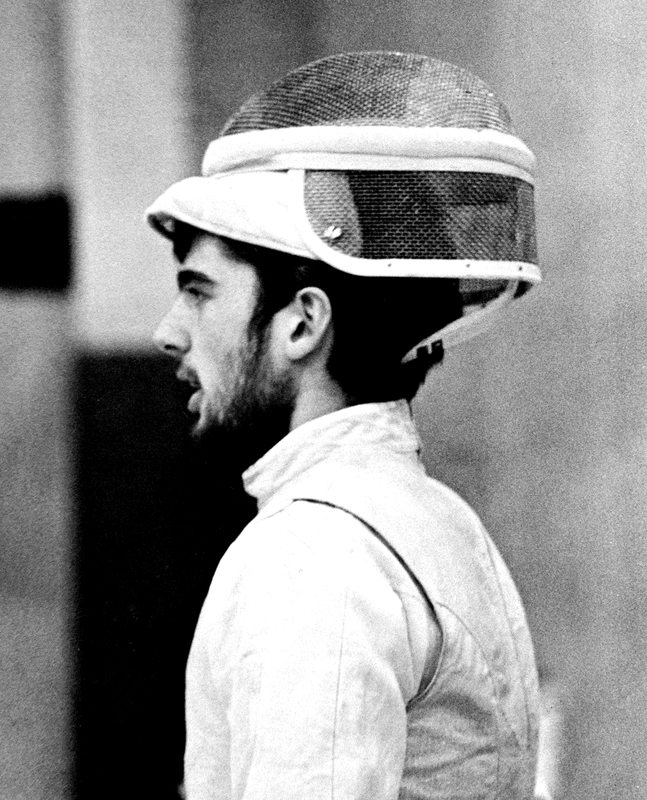 A celebration of his life was held at the Salle Trois Armes Fencing Center on December 19th. Please contact Francis Storr with any questions you might have. Francis was one of Rocky’s pupils, and is also responsible for this site. He can contact members of Rocky’s family if necessary. I’ll run you into the ground next time!